1975: Griggs scores 5 TD in 42-27 Rider Win. 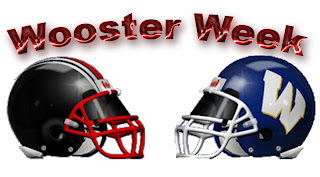 In what was to be the first of 2 great individual performance against the Generals, OHS sophomore Mark Griggs ran for 282 yds and 5 TD's as the Riders outscored the Generals, in what was, and still is an all-time record for total points scored in an Orrville-Wooster game, 42-27. Griggs dazzled the home crowd at Red Rider Stadium, scoring on runs of 70, 1, 55, 3 and 70 yards, and also caught 1 pass for 18 yds, giving him 300 of Orrville's 429 total yards for the game. The 5 TD's gave him 9 rushing TD's on the year, and the 282 yds nearly doubled his season total of 309 yards coming into the game. One other name that sticks out in this article, is that of running back/kicker/receiver and current OHS football coach Doug Davault. The junior kicked 6 extra points (and finished the season making 21 PAT's in a row) and threw for a TD in the game and the for '75 season was the teams leading receiver (23 rec. for 323 yds, 2 TD) and second leading rusher (131 carries for 517 yds, 6 TD). He also threw 2 TD passes on halfback passes. The 6 win season halted a streak of 2 straight losing seasons by the Riders. Coach Tipton remarked at the end of the article that it was good to get a winning season again. It must have been a feeling he liked, because he would never again experience a losing season as Red Rider head coach, tallying 13 straight winning seasons until his final season at the helm in 1987, and 16 straight winning season overall for the Red Riders. 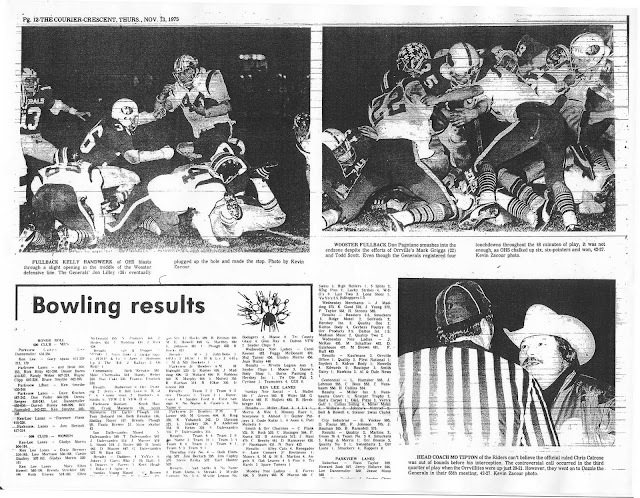 Here's the game article, along with complete stats for the game and for the entire 1975 season. Also, here are some pics from the 1975 Wooster game. 1) Look at Kelly Handwerk's helmet in the top left picture, almost all of his black paint is chipped off. 2) I am forever in love with those huge skull stickers. 3) Is there any picture of Mo that doesn't elicit a smile? The man is just a legend. 4) We were wearing our white jerseys at home. Did we only have white jerseys at that time? Or did we wear white at home and red on the road? Lastly, here's a separate article from the game with plenty of miscellany....including a few more pictures. 1976: Encore! Griggs scores 4 TD in Rider win. It was probably not realistic to expect Mark Griggs to best his performance a year earlier, but he sure gave it his best try, scoring a mere 4 TD's (3 rushing and 1 receiving) and racking up over 200 all-purpose yards in a 37-13 Orrville win. Griggs ran 19 times for 161 yards, caught 1 pass for a 25 yd touchdown, and was helped out by a great effort by QB Brent Dewitz who went 12 for 18 for 136 yds and 1 TD, and back Doug Davault, who caught 7 balls for 80 yards and 1 TD, and threw a halfback pass to Griggs for his 2nd passing TD on the year (on his only 2 attempts!!). Davault also kicked a school record 43 yard FG. The Riders ended the season at 9-0-1, their 8th undefeated season in school history, their only blemish being a 0-0 tie with Manchester. It was also the 4th time in the Orrville-Wooster series that the Riders defeated the Generals in consecutive matchups. Here's the article, along with stats for the game and the '76 season, also, one pic of Griggs from the Wooster game, again, notice the Riders were solid red on the road. And check out the "Generals" on the back of the Wooster jerseys, another uniform trend that you don't see anymore. 1977: Three in a Row!!! No Mark Griggs shattering the record book, no 40 points scoring outbursts, but the Riders did shut out the Generals, 15-0, for the 6th time in series history (not counting 0-0 ties) and the Riders put the wraps on another 9-0-1 undefeated season (only a 0-0 tie with Tusky Valley prevented a perfect season), and stretched their unbeaten streak to 23 games. Griggs was held out of the endzone, but did manage 205 yds between the goal lines, raising his 3-year rushing total against the Generals to 648 yds to go along with 9 total touchdowns in 3 Wooster games, a good season for most backs. Griggs' running mate in the backfield, senior Kelly Handwerk did all the scoring damage, rushing for 2 TD's and kicking a 21 yd field goal to cap the scoring. 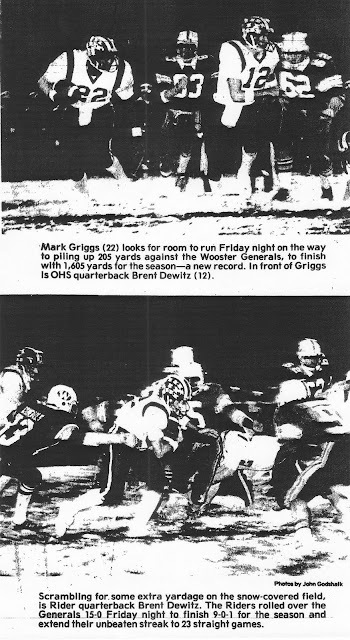 For the 1977 season, Griggs ran for a single season record 1605 yds, and for his Orrville career tallies 3551 rushing yards, a record that still stands. The 1977 win was the first time in the series the Riders won 3 in a row against the Generals, and they would make it 4 in a row the next year in 1978. The period of 1975-78 started a real age of dominance by the Red Riders in the series. From 1975 through the 1999 contest, the Riders beat the Generals 19 times out of 24 chances. Here's the game article, make sure to read near the end when Coach Tipton discusses his assistant coaches. What a list of coaches. 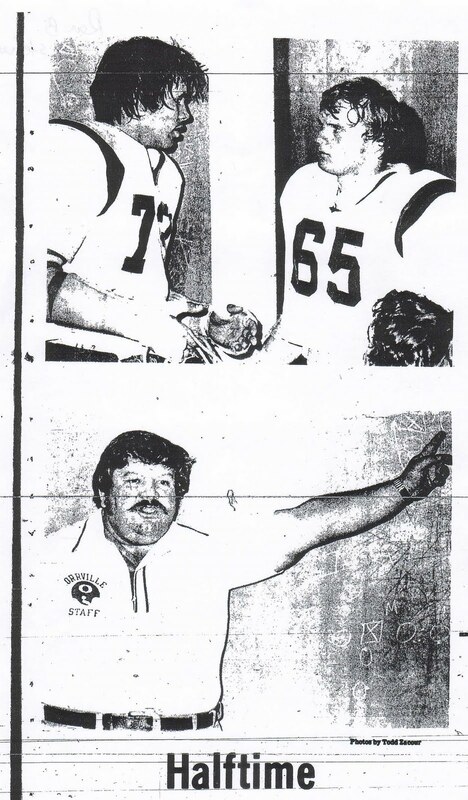 From current Illinois coach Ron Zook to Dave Vodika to current Dalton High School head coach Bob Ramsay and Fred Blosser. Here are some pics from the game too, check out the snow on the ground. When was the last time it snowed for a Wooster game? A long time for sure. One last picture....brace yourselves.....Mo drawing up the X's and O's at halftime. Where o Where could I get my hands on one of those "Orrville Staff" shirts? Just fabulous.